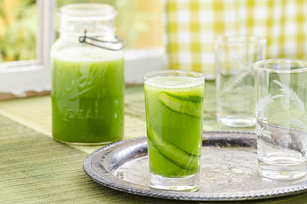 Blend cucumbers, melon, mint, drink mix and half the sparkling water in blender until very smooth. Add ice; blend on high speed until thickened. Pour into 1.5-L glass or plastic pitcher. Stir in remaining sparkling water. Serve immediately. After chopping the cucumbers for this refreshing drink, slice the remaining cucumber and use it as a garnish for the pitcher or filled glasses. Prepare using Crystal Light Lemonade Low Calorie Drink Mix. Blending the drink ingredients for several minutes results in a drink with a very smooth consistency. If you prefer a thinner drink, pour the prepared drink through a fine-mesh strainer before serving. Discard the strained solids. This refreshing minty beverage can be part of a healthy eating plan.